When Apple took the wraps off Mac OS X a decade ago, it clearly marked a big leap forward from the old Mac operating system. But as Mac users installed that first beta disk, it wasn’t exactly clear how big a leap OS X would turn out to be. With ten years of updates, innovations, and enhancements under our belt, we can now see how far we’ve come since Steve Jobs released the Mac OS X Public Beta at the Apple Expo in Paris on September 13, 2000. We now rely on OS X features that early OS adopters probably couldn’t even conceive of a decade ago. But which OS X innovations have been the most significant for the Mac and its users? We put our heads together and came up with a list of ten features—for the tenth anniversary of the OS X beta’s release—that we consider to be the most significant contributions to the Mac experience. Computing is risky business: All hard drives will fail eventually, and people accidentally delete files. Introduced with OS X 10.5, Time Machine was hugely important for one simple reason: It made backing up your data easy—and therefore, something you were much more likely to do. 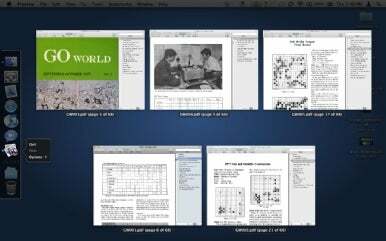 Apple’s Preview app is the visible face of Mac OS X’s system-level support for the PDF format. Mac users can easily create PDF files with any program that supports the Print command. Because PDF files recreate the layout of the original document, saving files electronically is now as convenient as printing them, except you’re free to save, e-mail, or embed them in other documents without losing their unique look. The Classic environment and Boot Camp are very different technologies, but they serve (or, in the case of Classic, served) the same essential purpose—provide the technological safety net and the psychological peace of mind that allowed millions of people to make the switch to Mac OS X. For most “classic” Mac users, the transition from Mac OS 9 to Mac OS X went far more smoothly than even the most optimistic among us expected. But it never would have been so had it not been for the Classic environment, a hardware-abstraction layer that let users run OS 9 applications within Mac OS X, side-by-side with native OS X software. Without the Classic environment, upgrading to Mac OS X would have meant either doing without your favorite software until it was updated for the new OS, or dumping all your existing software and starting over—a prospect only slightly more appealing than simply giving in and switching to Windows. The Classic environment wasn’t perfect—some OS 9 apps acted a bit quirky when run within Classic, and a few didn’t function at all—but for the most part it worked well and worked invisibly, tiding many a Mac user over until one day, as if by magic, it was no longer needed. Apple’s developer tools are probably the top candidate for the title of “most important technology that the majority of Mac users will never touch.” Back in the heady days of the classic Mac OS, developers who wanted to write software for the Mac were dependent on integrated development environments (IDEs) such as Metrowerks’s CodeWarrior. When OS X rolled around, Apple seemed to have realized that in order for its future platform to thrive, it couldn’t afford to have the means for creating great software controlled by someone else. Hence, the introduction of Apple’s own developer tools alongside Mac OS X. Included in the package was an IDE—Project Builder—that was a tweaked version of the IDE that came with NeXT, the OS whose acquisition laid much of the foundation for OS X. In 2003, Project Builder became the now familiar Xcode.